A moist decadent muffin full of mixed berries and chocolate makes these Chocolate Berry Muffins perfect for breakfast or brunch! Breakfast in bed is one of those things that is left for very special occasions in our house. Let’s face it though, my 3 year old is pulling me out of bed the minute she bounces into my room. So there is no time to just sit in bed before starting the day. So I’ve decided this year on Valentine’s I want to make it extra special. I’m going to try to steal a few extra minutes in bed with my hubby while we enjoy a plate full of muffins and of course some hot coffee. What I love about muffins is the fact that they are so versatile and you can basically add anything to them and they come out great. Muffins are also the type of breakfast that you can make ahead of time. 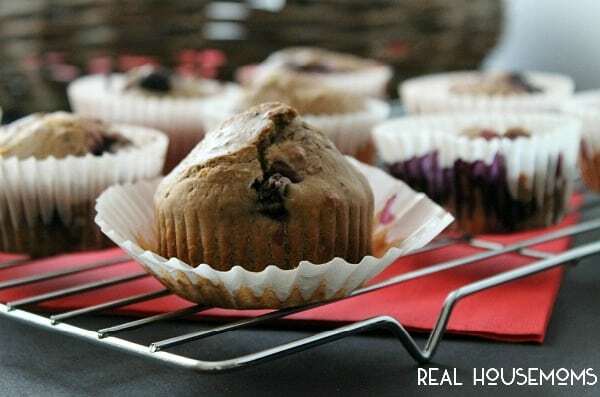 I’ve made these Chocolate Berry Muffins ahead of time so when a special day or moment comes around I can pull them out of the freezer, pop them into the microwave for a few seconds and they will be as fresh as ever! Mixing these up is pretty basic but there are a few steps to making them just right! The chocolate is actual chocolate chips melted and mixed right into the batter. I did try to use one brand of chocolate hazelnut spread but when I went to melt it in the microwave it basically burned. I’m thinking I need to believe the package when it says do not microwave. So instead I pulled out my trusty double broiler and got to melting some chocolate. The berries I used was a mixed medley of berries but I would suggest making sure you pull out the strawberries and save them for a different recipe. They basically just melted away during the cooking process and just made one big mess. Other than that I think you are ready to make some muffins! A moist decadent muffin full of mixed berries and chocolate makes these Chocolate Berry Muffins perfect for breakfast or brunch. Preheat oven to 400 degrees. Line two muffin pans with paper liners and set aside. In medium bowl add flour, baking powder and sugar. Whisk together. In mixing bowl add eggs, milk and butter. Whisk until combined. Add dry ingredients to mixing bowl and mix until well combined. Fill muffin liners to 3/4 of the way full. Bake for 20 minutes. 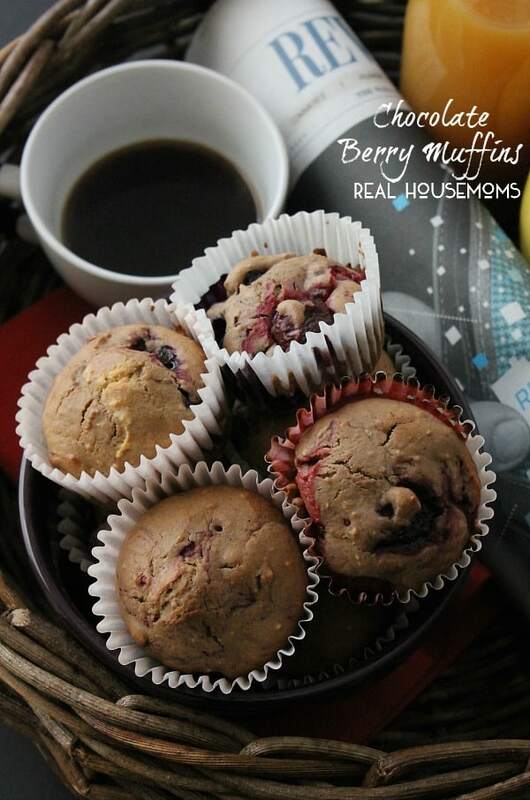 So when Valentine’s or any moment you want to surprise that special someone with breakfast in bed comes around go ahead and make these Chocolate Berry Muffins! ENJOY! These muffins sound divine, Nancy! 🙂 You can never go wrong with chocolate and berries! 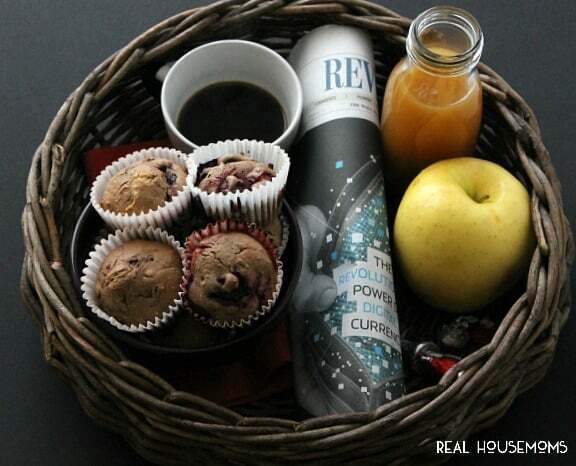 Breakfast in bed is hard to pull off around here too but I really want to try these muffins! Yum and pinned! I love this Nancy! We could totally savor every luscious bite. Pinning this!